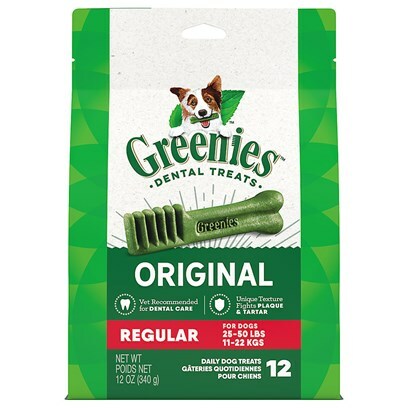 Our dog loves Greenies! Keeps teeth clean & breath fresh. My dogs love this "treat"! Dogs love them!! Great price. 3 O'clock is "Tooth Burshing Time"
"MY FAVORITE DUAL PURPOSE TREAT!" My dog thinks they ar a TREAT! Great treat & teeth cleaning. Great for dogs with sensitive teeth. The chew that made the trick!! Our Australian shepherd gives these 5 stars! Great for Senior Dogs Too! My Yorkie Wouldn't Do Without Them! My Dog Loves These Chews! No question.. best doggie chew ever! Keeps his breath fresh and teeth clean too!